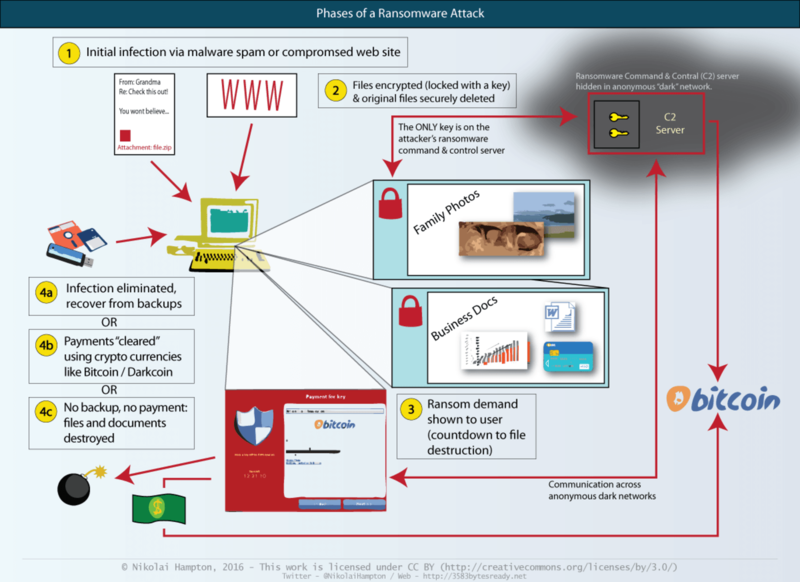 Scooper - Technology News: What is Ransomware? You have probably heard of viruses and malware . These dangerous pieces of software can make their way into your computer and wreak havoc. Malware authors are intent on stealing your data and disrupting the proper functioning of your digital devices. Then there is ransomware . This is crafted by cyber-criminals for extorting data from innocent users, and is rapidly becoming a threat to individuals, small business and corporate users alike. Unlike malware, ransomware does not steal data. Rather, it holds it captive by encrypting files and then displaying a ransom note on the victim’s screen. It demands payment for the cyber-extortion and threatens obliteration of data otherwise. While the concept of ransomware has existed for more than 20 years, it wasn’t until 2012 that several key technological advances aligned and allowed it to flourish. Now ransomware has evolved. It combines file encryption, it uses “dark” networks to conceal the attacker, and uses (or, rather, misuses) cryptocurrencies , such as Bitcoin , to prevent law enforcement from tracing the ransom payment back to the attacker’s den. For a small upfront cost and with low risk of getting caught, ransomware developers can net good returns: industry estimates range from 1,000% to 2,000% return on investment. Paying small ransom amounts is quite simply adding to the problem. If you don’t, you lose your data; if you do pay, then you contribute to a worsening problem. Yet for ransomware creators, it’s a lucrative business. Industry figures vary greatly, but reports suggest that developers can earn more than US$1 million per year, which is enough to attract skilled programmers and engineers. There have been many reports of Australian businesses paying ransoms. Even the authorities aren’t safe, with several police departments in the US having paid ransoms in order to recover files. And we’ve even seen reports that FBI experts have advised victims to “just pay the ransom” if they need their data. The biggest concern with ransomware is the rate at which it is adapting to combat security protections. We recently examined the evolution of ransomware and found that ransomware developers are learning from their mistakes in previous versions. Each generation includes new features, and improved attack strategies. We also found that over 80% of recent ransomware strains were using advanced security features that made them difficult to detect, and almost impossible to “crack”. Things don’t look good for end-users; ransomware is increasingly using advanced encryption, networking, evasion and payment technologies. The developers are also making fewer mistakes and writing “better” software. It’s not a stretch to imagine a ransomware developer currently working on ways to attack even corporate databases, or versions that lay low while they identify all of your backup disks. Ransomware is a very real threat. Its rapid growth is being driven by the low risk to attackers and good financial returns. We all need to stay ahead of the game. Let’s start now and be safe not sorry!